18 year old Ellie was born blind due to Retinopathy of Prematurity, but now she is reaching for the stars….. in a TARDIS! 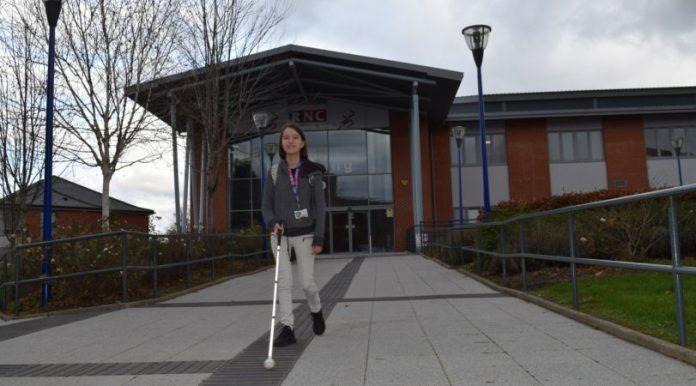 Ellie started at the Royal National College for the Blind (RNC) in September on a 1 year programme. Having previously attended a local mainstream school and achieving excellent results in her A Levels she also realised that the jump to university might be a bit too big. ‘I felt I needed a transition year between sixth form and university to prepare me for higher education life. I needed to increase my independent living skills significantly – I just could not do that alongside my GCSEs and A Levels’. Ellie’s 1 year programme at RNC is built around her aspirations and focuses on preparation to higher education. This includes kitchen and living skills, mobility and travel techniques, as well as IT skills to ensure she is able to use a PC and all its packages in university. Ellie also has transitional support on her timetable, allowing her to focus on writing a strong personal statement for her university application, searching and evaluating the course options, and arranging visits to the universities to meet their student support teams. As a keen singer and songwriter, as well a talented actress who has appeared in Call the Midwife and is due to star in Doctor Who, her timetable has included an OCR Level 3 in Performing Arts which is the equivalent to an A Level. Ellie is also able to use this course to practice and enhance her acting skills by studying units such as Skill Development in Performing Arts, Performing Arts Practice and Community Arts Project. The episode is titled ‘It Takes You Away’. The Doctor, Ryan, Graham and Yaz discover a boarded-up cottage and a girl named Hanne (Ellie) in need of their help. What has happened here? What monster lurks in the woods around the cottage – and beyond? Tune in on Sunday 2 December to watch.